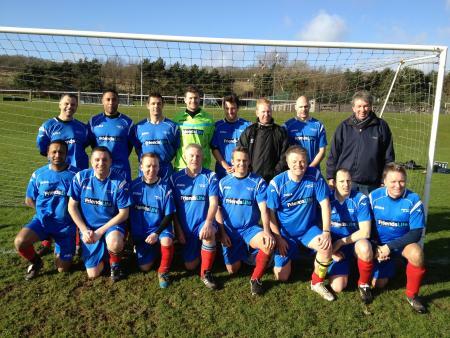 Cribbs Vets started out as Sun Life Vets and we used to play in the Golden Oldies festival at Fry's Club. Occasionally, we would play friendlies against the likes of Winscombe Vets, mainly because they had floodlights and they were very social "Beer Matches". As successive insurance companies acquired or merged with others, we became AXA Vets followed by Friends Life Vets. In 2013, Friends Life decided to close the Sports Ground so we set about keeping it open as a community club and re-named the Football Club - Cribbs FC. Robbie H has survived from day 1 of the Vets existence and has now clocked up 25 years as a vet footballer, amassing over 1200 appearances for Cribbs FC. He was quickly followed by now Chairman Dave Nelson, who still attends most matches and collected over 750 appearances too. We think we are the sole surviving founder team of the Bristol Casuals League, still in Division 1 - albeit our name has changed three times!! Season before last, we just survived on goal difference, so not sure how much longer we can hang on! Honours have been very scarce but the fun of the changing room banter has always been the most important factor of turning out, for most of us. We are forever grateful of the efforts of present and past organisers of the Casuals League. Thank you!